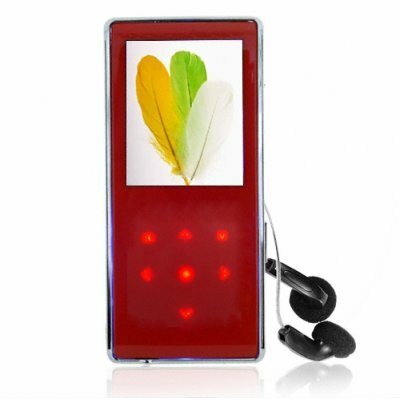 Successfully Added Music Lovers MP4 Player 4GB Red to your Shopping Cart. The Red version of the popular Music Lovers MP4 Player. For all you PMP fans who crave having superb quality sound from your music, and demand being able to tweak music for the best possible results, then this new super HQ red 4GB Chinavasion Music Lovers Edition MP4 player is the Portable Media Player that you should be looking at. In addition to its impressive 2.0 Inch TFT LCD Screen, displaying highly rendered Digital Movies at 208x176 pixels, you get an impressive amount of audio and video formats to play. Listening to the music however is where this MP4 player shines. Adjustable SRS WOW settings will bring sound to life, whether it is though the built-in speaker or though the HQ ear buds. And don't worry about finding room for your files, as this PMP also has a mini SD slot letting you increase the memory an additional 4GB to make the total available an incredible 8GBs. Throw in the Touch Button interface with a Button Lock function, and you got a system that not only wows with its music, but just looks plain cool. Listen to music as it was meant to be listened to with this portable media player available to you exclusively through Chinavasion's online store. This is the older version of the Levitating Magnetic World Globe. Please click here to see the latest version, in stock now. If you wish to make comments or reviews about this product, login and use the product review box. Please open an inquiry ticket if you have questions regarding this item.